Down in the lair, Michelangelo is inflicting a zombie movie marathon upon his brothers. The others get bored and go to bed, but Mikey decides to stay up all night watching. By about 3am, however, he starts freaking himself out and decides to go skateboarding rather than sleep. While grinding rails in the back alleys, Mikey sees hordes of shadowy zombies shambling through the streets. Terrified, Mikey flees back to the lair and tells his brothers. They think he just imagined them, but Splinter insists they all get out of bed and investigate (as a lesson in vigilance, of course). Observing from the rooftops, the Turtles are shocked to discover that Mikey was right. 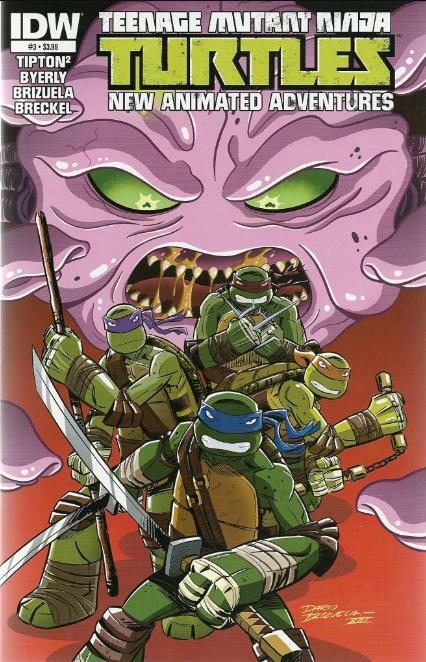 However, Donatello notices that the “zombies” aren’t so much the undead as they are an army of sleepwalkers. More than that, they’re all carrying purloined high-tech equipment back to the Sleep Research Institute. They scale the building and peek in through the skylight. Inside, they spot a group of Kraangdroids directing the sleepwalkers to build a giant machine with the stolen equipment. The machine, once activated, will turn every New Yorker into a “zombie” slave. The Turtles see a pair of Kraangdroids carry a scientist off, saying that her assistance is no longer needed, and they decide to intercede. 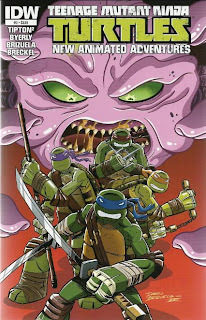 In a back office, the Kraang are about to execute the scientist when the Turtles bash them to pieces. The scientist introduces herself as Dr. Annie Sloane and says that the Kraang forced her to build the machine. They ask if there’s a way to stop it and she gives them a thumb drive that can free all the zombies and then destroy the equipment. Thumb drive in hand, the Turtles burst into the lab and take on the Kraang. The zombies all attack and the Turtles don’t want to hurt them, as they’re all just mind-controlled civilians. Unfortunately, the zombies keep getting in the way of their fight with the Kraangdroids, severely slowing the Turtles down. Mike sees an opening and tells Donnie to toss him the thumb drive. 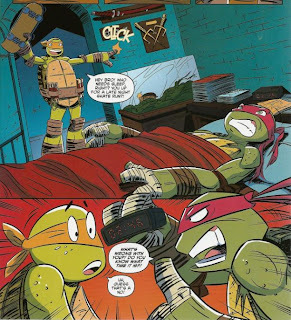 Donnie doesn’t want to risk putting the thumb drive in Michelangelo’s hands, but Leo reminds him that Mikey was right about the zombies when they wouldn’t trust him, so maybe they should give him the benefit of the doubt. Don tosses Mikey the thumb drive and he inserts it into the machine. The machine begins to go haywire and all the zombies are freed. Dr. Sloane then directs all the people out of the building before the machine explodes. The Turtles escape just in the nick of time as the whole thing detonates. Down in the sewer, Leo, Don and Raph tell Splinter he was right to send them to investigate. Splinter corrects them, saying that the only thing he was right about was trusting in Mikey. Speaking of Mikey, the Turtles wonder where he’s run off to. They find him in the living room, getting ready for a vampire movie marathon. *This story is continued from TMNT New Animated Adventures #2. 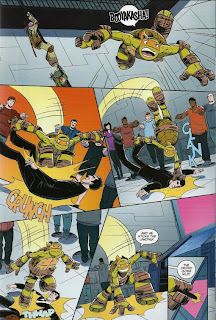 The story continues in TMNT New Animated Adventures #4. *This issue was originally published with 3 variant covers: Regular Cover by Brizuela, Cover RI by Tanya Roberts, and Cover RE Montreal ComicCon Exclusive by Adam Archer. Man, trying to find room for all those rambling, redundant, ponderous Kraang dialogues must be murder on a letterer. So good on Shawn Lee for getting it all in there without looking distracting. Anyhow, this was a pretty simple done-in-one story, but I was impressed to find how smoothly it flowed considering it was scripted by three people. Usually an excess of creators leads to a “too many cooks” situation, but the whole thing read very well and the story held together from beginning to end. Yeah, it suffered from some cornball clichés, but I’ll give them credit for putting the convenient self destruct program in a USB stick instead of at the mercy of a big red button conspicuously attached to the side of the Doomsday Device. This was a Mikey spotlight and like a lot of Mikey spotlights in the cartoon shows, it suffers from trying to make an argument to support the continued inclusion of “the comedy relief character”. You know that kind of story: Where all the useful characters shake their heads at how stupid the comedy relief character is, but in the end the comedy relief character does good and saves the day, leaving the other characters to realize they were wrong. Snarf had stories like that, Slimer had stories like that, Orko had stories like that and Mikey has had plenty of stories like that. Admittedly, this comic doesn’t do it as transparently and avoids the worst artifact of the cliché: having the comedy relief character cause the trouble in the first place. I hate that. Because when they resolve the conflict at the end, it doesn’t mean they’re a hero, it just means that they’re moderately competent enough to clean up their own messes. But again, this story avoids that drawback, so it earns a few bonus points in my book. On a personal note, I don’t think you should ever have to “redeem” or "make a case for" your comedy relief character; because if you feel compelled to do so, then you were clearly handling them wrong from the very beginning. And why do comedy relief characters have to be blundering screw-ups, anyway? Just because a character is funny doesn’t mean they have to be useless. I haven’t really gotten that vibe quite so much from Nickelodeon Mikey yet, I’m just getting that opinion out there is all. Even though the story was fairly simple, the Tiptons and Byerly speckle it with some funny gags and witty banter. I think it’s this approach which has made New Animated Adventures feel so authentic in relation to the Nickelodeon cartoon. The Nick series also uses a lot of basic, simple, episodic stories, but spices them up with really strong humor and characters, proving that just because something is a familiar plot cliché, that doesn’t mean it can’t still feel fresh and fun in the execution. 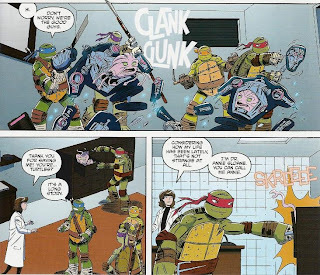 In regards to this issue, I got a chuckle out of Raph tossing the Kraang aliens in the filing cabinet as well as all the zombie movie jargon dotting everyone’s dialogue. Everything from Donnie lecturing on the classical voodoo interpretation of zombies (see, “White Zombie”, “The Serpent and the Rainbow”) to Raph whining that he prefers modern running zombies (see, the “Dawn of the Dead” remake or the faux-zombies of “28 Days Later”) to everyone sighing at how slow and easily avoidable the shambling Romero-type Zombie is (see, er, all the Romero zombie movies… except “Land of the Dead” and “Diary of the Dead” because those blew). So far as stories with the moral “Mikey’s not useless, we swear” are concerned, this was one of the better attempts and handles him pretty well. A very basic, run of the mill story, but the execution is what elevates the whole package.